So our lovely featured image was my first attempt at a Steampunk clock. 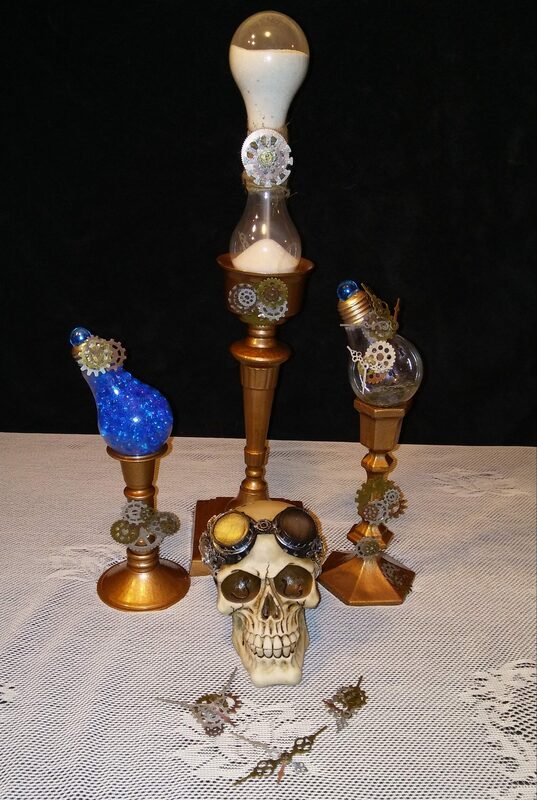 Can you tell it was my first Steampunk anything with the overflowing abundance of gears? This version was created two years ago when our old clock in our apartment broke (I “accidentally” dropped it). I couldn’t find any clock that wasn’t overly expensive that I liked even a little bit, so it was time for me to create something that I liked and wanted. I checked out our local craft store only to discover that clock parts are bloody expensive, so off to the thrift store I went. I found this clock for five bucks. Now I don’t have an original picture of the clock but I believe it was a 4th of July theme from a fire department. Anyways, it worked just fine for two years but the battery finally started to die recently and with all the flipping I have been doing, the clock became something something that had to change. I first had to pick what sort of theme I wanted to do because the over abundance of gears had to go. As the clock hangs in the kitchen and the kitchen it all about tea, it only made sense to do an Alice in Wonderland theme, at least in my eyes. I was able to pick up an older version of the book for the cheap at our local Half Price books. Then it was time to strip the previous version. That was a pain in the bum. It wasn’t the gears but the paper I had used previously to cover the clock. Shredded little pieces of paper glued on was time consuming to remove but once I did (with a tiny bit of creative cursing), then it was time for my Alice in Wonderland pages. Just glued on. Not stained nor burned. Kind of dull but still cool looking. Now it was time for me to tea stain the pages. I used a Chi and an orange tea because I am missing good old fashion plain tea (I really need to get that sometime soon with all the tea staining that I do). That’s okay because it still turned out pretty with a unique coloring. I don’t have a picture of this step but you will be able to see it with the completed pictures. I got overly excited again but missing one picture isn’t as bad as what it could be when it comes to me. After I had it stained, burned and sealed, it was time to choose what I would use as the numbers for the clock. Originally I used sculpey clay to make a set of tea pots, tea cups, spoons, plates, sugar bowls and milk pitchers. I did not like them at all. I was forced to toss them. Side note: I have discovered, at least in my experience, that if you make your pieces too thin, then they will distort. It was one of the main reasons that I was forced to throw away my original set and brain storm what to do next. So on my second attempt I made my pieces a little thicker, still made two tea pots and two tea cups, but I wanted something a little more whimsical. I turned to what I have in my Steampunk chest for bits and bobs and focused on a pretty metal rose I had. From there my brain turned towards the Queen of Hearts and the decks of cards she had as guards. I know that she isn’t part of the tea party but I still wanted to use that idea, so I cut out a heart, club, diamond, and spades. I also used cut out two top hats, it is a tea party after all and there is no tea party without the Mad Hatter. As I rummaged through my Steampunk chest I also discovered a tiny bottle with even smaller playing cards that I had forgotten about (purchased at Michaels in the jewelry department). I knew I had to use those playing cards. After I baked my clay (it really did turn out so much better with something thicker between my clay and a hot pan), it was time to paint/touch up. I used my favorite spray paint, Rust-oleum’s hammered copper (yay for a hammered copper look) and Rust-oleum’s hammered bronze. After the paint had dried (side note: it will take longer to dry versus using the spray paint on any other surface. At the time of assembling the clock, my paint was still slightly tacky) it was time to glue on my detail pieces (so much super glue ended up on my hands). Finally, it was time to add my pieces to the clock in their proper places (after I had to fix/fight with the clock because it wasn’t working properly, the hands are tricky and very touchy). To do this, if you do a clock on your own, just spin the hands to form the hours. Easy, no marking things off will be required for you. I know my sculpey work isn’t the best but give me time and it will get better. I know it also doesn’t look evenly spaced but that’s because of the size difference of the pieces. Besides, I like the slight chaotic feel. Once again, this was another project that wasn’t overly time consuming. I promise that there will be one eventually. I am flipping our library (that’s right, we have an actual library in our home) this summer and that is going to take several months worth of work. I will break it down for you peeps when that happens but now back to the clock. It was a fun project and again a cheap one. Creating your own clock is something I recommend everyone try at least once.